As the Unicode Consortium evaluates a proposed update to emoji standards that includes new Google-recommended characters representing various professions, Apple in August submitted its own suggestion to add another five jobs to the list. 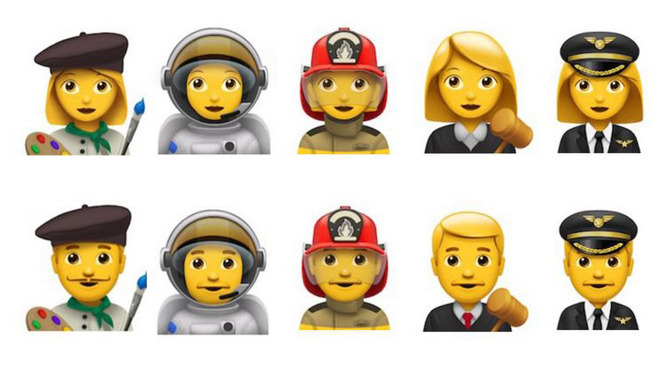 According to Emojipedia, Apple engineer Peter Edberg filed a recommendation to update Unicode's emoji standard to include zero-width joiner (ZWJ) sequences for male and female astronaut, artist, firefighter, judge and pilot professions (PDF link). ZWJ sequences are non-printing characters that can be used to modify or join two emoji together to form a new character. In the case of professions, the ZWJ sequence joins the common man or woman emoji with an object. For example, a male firefighter emoji incorporates the code sequence "man, firetruck." Google was first to suggest an expansion of emoji professions in May, with entries like health worker, farmer and technologist headlining the company's list of refinements. The latest draft update for Unicode Emoji 4.0 —referred to as Unicode Technical Report 51 —includes 16 professions with support for gendered emoji, making for a total of 32 new characters. Emoji 4.0 also includes new flags, skin tone modifiers and gendered emoji, among other enhancements. As it stands, the "Emoji ZWJ Sequence: Gendered Role, with object" list includes Health Worker, Judge, Pilot, Farmer, Cook, Student, Singer, Artist, Teacher, Factory Worker, Technologist, Office Worker, Mechanic, Scientist, Astronaut and Firefighter. The review period for Emoji 4.0, which appends Unicode 9.0, ends in October ahead of a planned release in November. Apple developers and beta testers running iOS 10 already have access to many of the 72 new characters set to debut later this year.